A week ago at this very moment we were just arriving home from our overnight trip to Roche Harbor, the first part of which I wrote about here. Now we’re in New York, on day two of our next trip. If I don’t say more about Roche Harbor soon, I’ll never get back to it. Here, then, a short follow-up post. 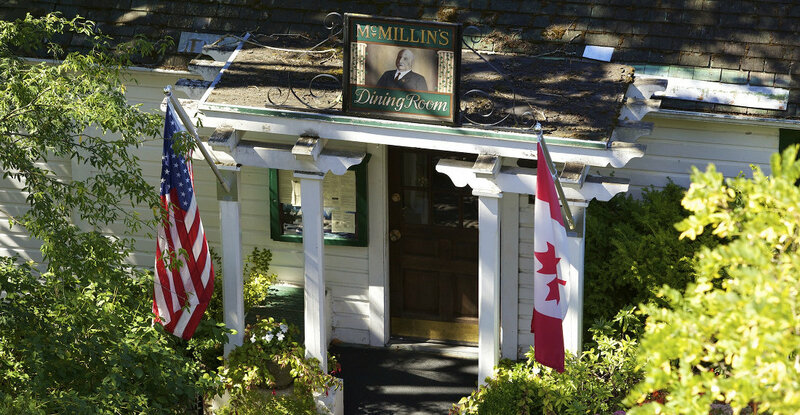 I left off as were were about to enter McMillin’s, Roche Harbor’s principal restaurant, for dinner with Russ and Tobae on Friday night, a week ago last night. A new menu was debuting that very night. Having not seen any previous menu, we weren’t well positioned to recognize what was new about it. The most significant feature was the plethora of small plate dishes. One heading explained that even the entree type dishes were served small, so that one could try several or a group could share several, though it further noted that those desiring more traditional sizes could request them. Thus, instead of a tiny halibut helping, one could have a standard halibut entree. On the back page, though, was an alternative: McMillin’s classic 45-day aged prime rib. This was offered in three sizes, small, standard, and large. Gail, who rarely passes up a good prime rib, instead chose small halibut. The rest of us ordered prime rib. It was excellent. I ordered a salad with truffle oil dressing and the truffle oil was just too much for me. It overpowered any other flavor, except some fantastic tomatoes. Gail had a crab bisque, which I traded her for. Our table was at a window, with a view out over the harbor. A seal showed up at one point. Later we had perfect seats for the over-the-top flag lowering ceremony. First the Canadian flag came down while the Canadian national anthem, then the Union Jack and God Save the Queen, then the US flag and taps, all this blasted over a sound system that ended any dinner conversations. But the evening highlight came later. We parted with Russ and Tobae around 9:45 and went up to our room, which looks down on the restaurant from across the path. At 10:00 sharp, the cover band started up. It was playing by the bar outdoors, which meant everyone got to listen. Forget sleep. They stopped a little before midnight. I had forgotten the email sent to us in early July with the good news that there would be live music at the bar every Friday and Saturday night from 10 to midnight. I hadn’t quite understood that this was to be understood as a warning. We did eventually go to sleep. We awoke Saturday ready for the primary purpose of the outing: our boat ride in search of whales and our feast across the harbor on Pearl Island at the home of our hosts. More on that in Roche Harbor post #3. 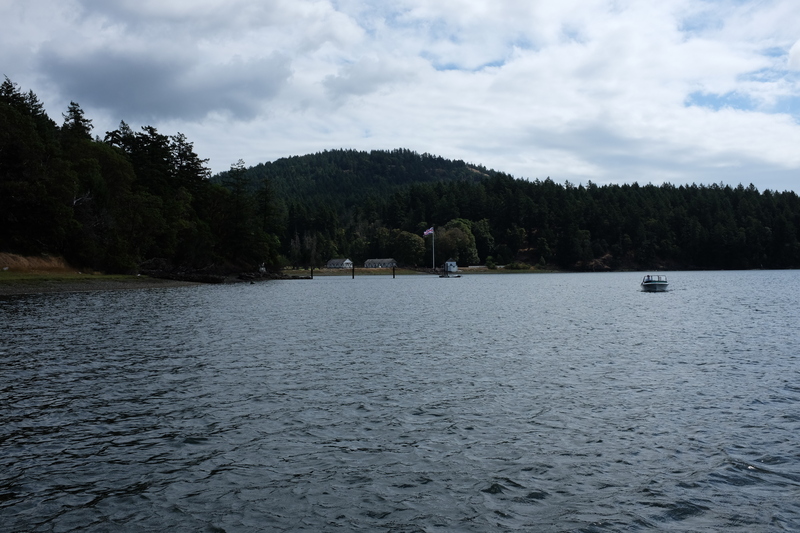 As a preview, below is a photo I took during our boat ride of English Camp, part of San Juan Island National Historical Park. When Great Britain and the United States in 1859 agreed to a joint occupation of San Juan Island until the water boundary between the two nations could be settled, it was decided that camps would be located on opposite ends of the island. Shortly after the British and American governments affirmed Lieutenant General Winfield Scott’s proposal to jointly occupy San Juan Island, the Royal Navy started looking for a home for its British Royal Marine Light Infantry contingent. Capt. James Prevost, commander of H.M.S. Satellite, selected the site on Garrison Bay — 15 miles northwest of American Camp — from among seven finalists. He’d remembered the bay shore from explorations two years earlier as a part of the water boundary commission survey of the island. At that time, one of his officers, Lieutenant Richard Roche, had commented on seeing abandoned Indian plank houses nestled among a vast shell midden. Roche described the ground as “well-sheltered, has a good supply of water and grass, and is capable of affording maneuvering ground for any number of men that are likely to be required in that locality…” He added that a trail, 11 miles long, led from this area to the Hudson’s Bay farm at Bellevue. The marines departed in November 1872, following the final boundary decision of Kaiser Wilhelm I of Germany. They left behind a facility so solidly built that the Crook family (who purchased the site from the U.S. government) occupied several of the structures for more than 30 years.